Pick Your Sale! · KenMar Photography Inc. Facebook Twitter Instagram Pinterest Client's Area Search this site. Congratulations on achieving your senior year! Let’s help you make it special! Let’s determine a range of prices for the amount you want to spend. You’re sure to get exceptional value, lots of choices and find a package for every budget. And we have no minimum orders! Small gift portraits (10 inch and smaller) start at $73. Wallets start at $56. Build your own package and save 20% off à la carte prices! Call KenMar Photography at (920) 734-5328 for more details! Your graduation calls for the very best pictures you’ve ever had! 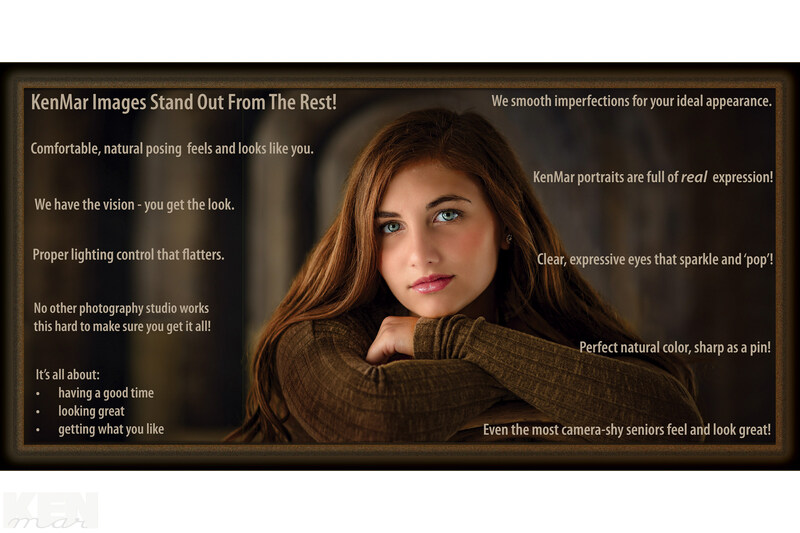 Let KenMar capture your personality in photos you’ll absolutely love. Call 920-734-5328. Free Cap and Gown (session & print) in May 2018. $55 value! Free Buddy/Boyfriend/Girlfriend/BFF/BAE Session. $25 value! Free Family Portrait Session. $95 value! Perfect, natural color, sharp as a pin. Even the most camera-shy seniors feel and look great! We turn your personality into portraits you’ll cherish for a lifetime! A half hour photoshoot + 2 small gift size portraits 16 wallets + yearbook photo sent to your school = all for under $250! 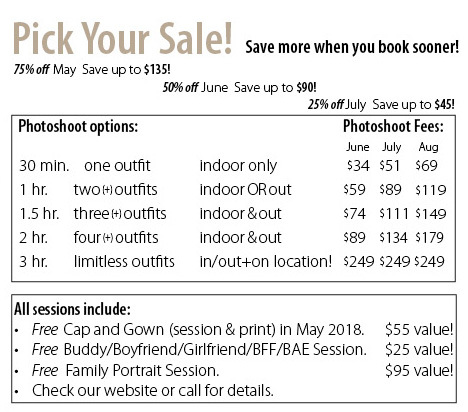 CLASS OF 2018: 75% OFF SESSIONS booked in May! Save hundreds of dollars – book early! Get portraits you’ll absolutely love. Have an amazing fun experience! Get a 110% money-back guarantee! Prime session times are going FAST! 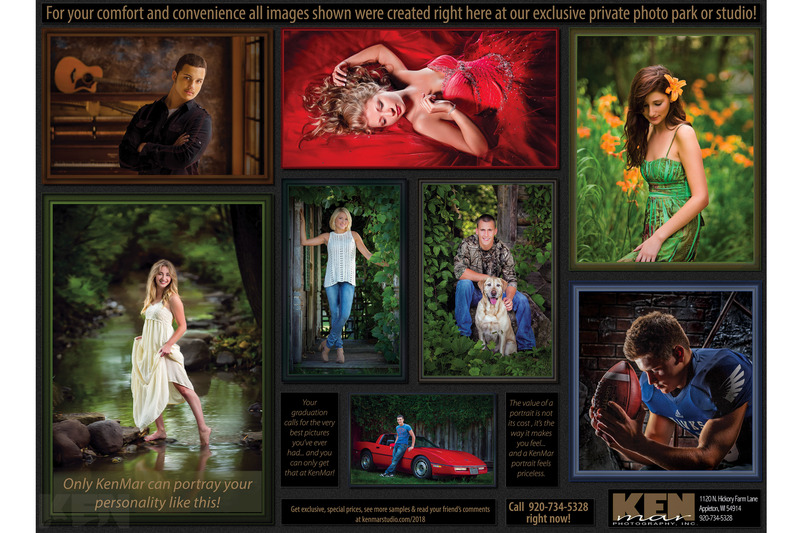 All images are created right here at KenMar’s exclusive, private photo park. For your comfort and convenience, all these images were created right here in the studio or in our exclusive, private photo park! READY TO ROCK 2018? Call 920-734-5328. CLICK HERE TO HEAD TO OUR MAIN PAGE.